Collecting David Harvey's finest work on Paris during the second empire, Paris, Capital of Modernity offers brilliant insights ranging from the birth of consumerist spectacle on the Parisian boulevards, the creative visions of Balzac, Baudelaire and Zola, and the reactionary cultural politics of the bombastic Sacre Couer. The book is heavily illustrated and includes a number drawings, portraits and cartoons by Daumier, one of the greatest political caricaturists of the nineteenth century. 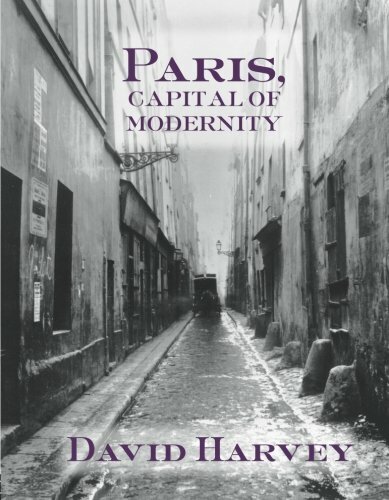 "'Harvey's work is notable for the sheer diversity of sources he draws on... A stunning book that will engage anyone with an interest in 19th century politics and urbanism... a definitive work on the historical geography of Paris which shows tremendous insight, forceful arguments, and above all, an obvious passion.' - Environment and Planning C: Government and Policy 'Harvey brings one of the most fascinating and confounding periods of French - or for that, European - history into sharp relief.' Publishers Weekly 'Much more than a simple narrative... [a] complex and sophisticated work.' - Library Journal 'David Harvey is perhaps the most important urban scholar writing in the English language, and here he is at his best.' - Thomas Bender, author of The Unfinished City: New York and the Metropolitan idea"
Collecting David Harvey's finest work on Paris during the second empire, "Paris, The Capital of Modernity" offers brilliant insights ranging from the birth of consumerist spectacle on the Parisian boulevards, the creative visions of Balzac, Baudelaire and Zola, and the reactionary cultural politics of the bombastic Sacre Couer. Stunning in scope and form, this is a long-awaited essential collection of David Harvey's magnificent writing on 19th century Paris.